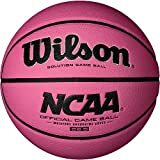 This Wilson Pink Basketball is a basketball which is the same as a regulation NCAA Women’s basketball but is pink. Of course, it can’t be used for official college or high school games due to its color, but it’s a great ball to use as a practice and warmup ball, getting autographs, raffles for charity, and just as a conversation piece. It’s sold by FogDog through Amazon. For Breast Cancer Awareness Month 2009, FogDog also has a number of other pink products in its Breast Cancer Awareness Collection , where you can save 15% off. But hurry, you need to order before 10/31.